Since we opened in September of 1990, we have kept a notebook of interesting stories that happen when our volunteers work. Just as our products come from all over, so do our customers! Kidron is situated in area that is home to one of the largest Amish communities in the USA and as a result, is a destination location. Many of our customers visit this area once or twice a year. 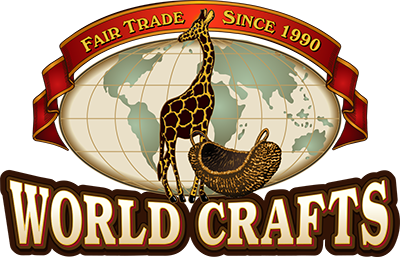 One couple from Manchester, New Hampshire took a celebratory 40th anniversary trip to Kidron just to visit World Crafts! Having been here several years ago they wanted to return. To commemorate their anniversary, they purchased a Kenyan stone sculpture symbolic of unity. Two ladies from Argentina shopping at World Crafts discovered they had common friends with the volunteer working in our store that day! Two sisters from Indiana stopped in our store; not once, not twice, but 3 times in one day! On this annual trip, they were looking for gifts for their grandkids. A lady from France was delighted to find our store as she splits her year between France and the USA. Our locals stop in for coffee, chocolate and greeting cards. One local, in an effort to reduce paper waste for gift giving, was delighted we had fabric gift bags. Another customer, upon leaving, said "Blessings on the good work you are doing." What encouraging words for us! We are doing a good work but can't continue without our loyal customer base! Being part of the Fair Trade world really is a team effort; the artisans, the support teams, the wholesalers, retailers and the consumer. The vision that began over 60 years ago in providing work for the underprivileged has blossomed into the huge Fair Trade realm of job generation in a fair, sustainable way. We've been part of the chain for over 25 years and are proud to be associated with such talented artisans, dedicated volunteers and faithful customers!